Witnesses of the Beslan massacre, where terrorists held over a thousand people hostage in a school building, recall the three days of horror back in 2004. A former teacher and a student told RT about what they went through 10 years ago. "Greetings on your last September 1, seniors," little Vera Guriyeva wrote on a chalkboard when helping her mom, a history teacher in Beslan school #1, to prepare for the September 1 ceremony. Her mom got confused: "It sounds creepy." "Yes, but it is their last September 1." So they kept it. That September 1 became the last one not only for the seniors, but for the entire school and the city. 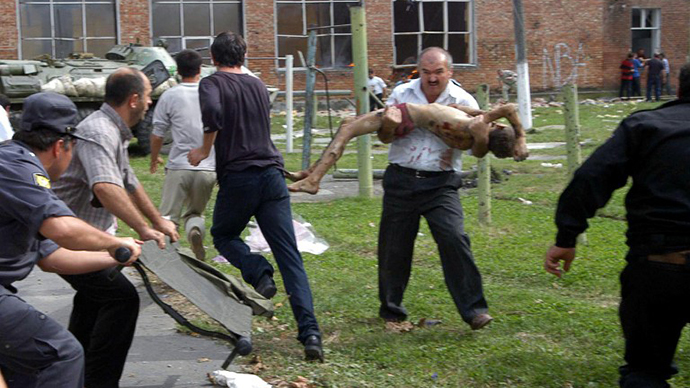 Beslan is now the only city in Russia where the school year starts on September 5. September 1 is a day of mourning here. "When I enter this gym, I feel like I’m walking on them. You know, literally on them," Vera Guriyeva’s mom, Nadezhda, whispers. It’s been 10 years but the wounds are still bleeding. “Vera died here. Over there, where there is a plinth now, I left my son Boris. My daughter Ira survived. After the tragedy she was berating me because she had had a bad dream the night before but I didn’t have time to listen to her in the morning – I was so busy. In her dream we were visiting our grandfather. We entered the house and there was a coffin there, grandfather died on September 1. So we were there and he was calling Vera and Boris, saying he was cold and asking us to warm him up. Ira was very frightened and I was too preoccupied sorting out questions with my students. Many seniors were late including those involved in the ceremony, there were no presents. And, when finally we were about to start, there they came." Most people couldn’t believe there were terrorists. It seemed to be a joke, a staged performance. Zarina Tsikhirova recalls she was not in the mood for the ceremony that day. "My mom talked me into going. My sister was a secondary-school freshman, so I had to show her the new building. We were worried she might get lost. When we were leaving, I stopped and waved at mom. She then said it looked as if I were waving farewell and her heart sank. She even said: ‘There, everything’s OK.’ And when she heard shooting she realized we were in trouble. She told me about it later, but when it happened, I was sitting on the gym floor thinking what I would tell her and how I would explain our being absent for so long. What should I say? Should I say we have been taken hostages? Nobody is going to believe it. How can it be possible? 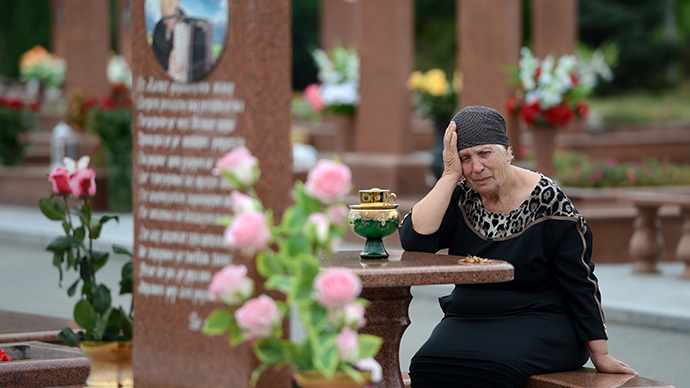 There can’t be any terrorists in Beslan – we have such a peaceful city." It took a while for Nadezhda Guriyeva to remember her own children were there, too. "My niece started tugging me by my hand and calling me – that’s when I realized my kids were inside this hell too. I took the girls and we sat under a shield. Boris was at a distance and wanted to join us under the shield but I was begging him to stay put. I saw there were two bombs – one above my head and one near me, but we couldn’t move. Finally, we got together with Boris, and he tried to be very supportive, soothing our little Vera. She didn’t realize what was going on. She even said it was great, they would be dismissed now and no classes would be held. She suggested that we go hang out for a while. She was just a little kid." They spent three days there – 1,200 people in the school gym. It’s hard to imagine how so many people can fit in a gym. "The men and seniors were the first ones to be shot. They threw their bodies out of the windows on the second floor. On the second day, they stopped giving water to the hostages. The kids were crying, and the terrorists were threatening to kill those who wouldn’t calm down. By day three we no longer cared," the witnesses recall. They just wanted it to be over. "On the third day we were absolutely sure we would never come out of that place and would be blown up there. When you see a terrorist holding his foot on a dead man's switch, you know that once he sways or falls asleep we will be blown up. We were so sick of this tension, we just wanted it to end. That’s it. So we were kind of anticipating something to happen. But the expression on the terrorists’ faces seemed relaxed. And then there was an explosion," Zarina remembers. We were down on the ground after the very first shock wave.That’s where I found the pieces of Vera’s dress. She was on fire. My daughter was on fire. When I came round, Ira told me: ‘Mom, everybody’s running.’ I told her to run too if she had any energy for it. It’s so good she stayed. Many started to jump out of the windows but terrorists were shooting them in their backs. We stayed put. I saw Vera was dead. Boris was all covered in blood but was moving his hands. It took me a while to realize the blood was mine. He was injured heavily but was not bleeding a lot. I tried to pull Boris out – there were other people on top of him. But then they started to move the hostages to another place. Those who couldn’t move would be killed. There was no chance I could lift Boris wrapping my arms around him – he was heavy, I couldn’t drag him all the way through the dead bodies. Moreover, I had two girls with me who were still alive, my daughter and niece, so I had to rescue them. How would they have done it all by themselves without my help? So we left. Boris was later found in a morgue. And it’s not too late or too early. When we were taken hostages, my brother thought the gym had broken into flames, but then the girls and I were out and he felt relieved. 'At least you are alive.' At least we have survived. The hell was over. But another hell was yet to come. Many started to accuse the teachers of the tragedy. There were all sorts of accusations, including us not showing up for the funeral and being indifferent. How can we explain that we were present there too, we had our own children to bury and we were injured as well? But they kept sending us letters with threats. Still, I understand them. You always want to find fault with somebody – it’s easier this way. Some people blame themselves, others blame everybody around. The survivors also felt guilty – because they had stayed alive. The parents, the fathers blamed themselves for not having saved their kids. I was pointing fingers too, but the thing is there are too many contributors, starting with those who destroyed the Soviet Union. Some left, some stayed back then. I was saved by the kids – by their love and belief. I find it very hard to talk about it, but it’s very important. I’m convinced that as soon as we forget the lessons of the past, there will be recurrences. We might rarely learn lessons from history but it punishes us hard when we don’t know what it has taught us. We finished our conversation. Nadezhda Guriyeva gave me a hug and said: "There, there, don’t cry!" She, who had gone through this, was soothing me. The chalkboard on which her daughter 10 years ago wrote "Greetings on your last September 1" is now in a memorial museum.